We love beautifully crafted presentations. We all talk about the presentation that left us in awe, but what’s less discussed is the effort that goes into creating one. Remember the moment when you just couldn’t find the right tool to edit an object? Or realized that a feature you assumed never existed, actually exists, tucked away in one corner of the presentation software? If only we had sufficient tips and tricks up our sleeves!! 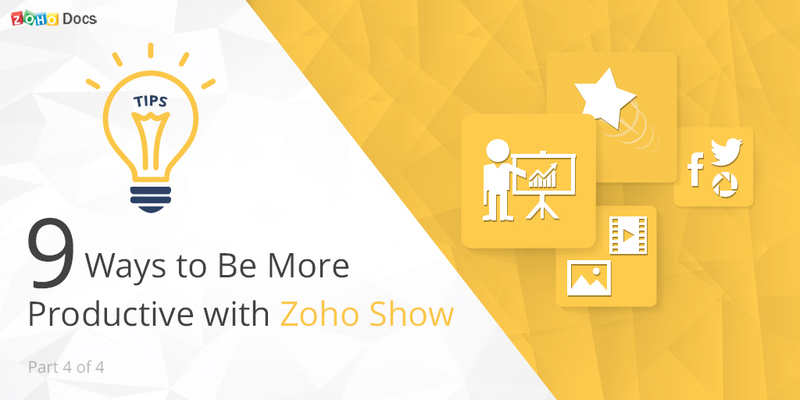 This week, we give you some really handy tips to create and deliver smart presentations using Zoho Show, our online presentation software. You put in time and effort to create a fancy slide by grouping together different shapes and objects. Now let’s say you have to edit some content in a text box that you had grouped. What do you do? Un-bundle the objects to edit the content? Well, good luck with that! Here’s a solution. 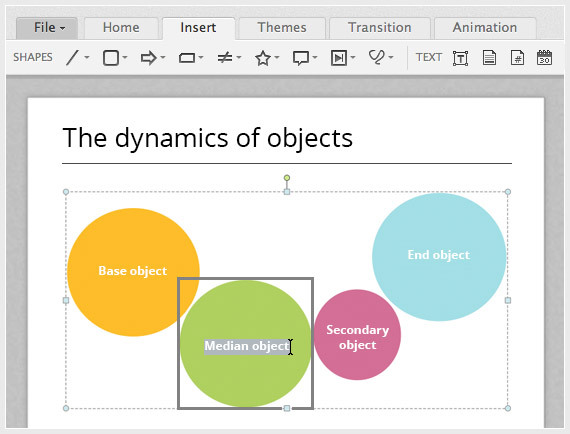 Zoho Show lets you effortlessly edit text in any group of objects, without breaking the bundle. Yes, without un-bundling the grouped objects. Just click on the object, and edit the content. Easy. When you’re working on a presentation with a deadline, every second counts. The last thing you want to spend time doing is browsing and inserting images on to your slide. Instead, just drag and drop the image directly into the presentation window. The Shape Grid (gridlines) is a simple tool to help you position images, shapes and objects inserted into a slide. Once you activate the gridlines, it gives you a visual cue of the center of the slide and the slide boundaries. It’s a simple tool that helps you align elements with precision and move them around as you wish to. Everybody loves a presentation rich with visually stunning images and those interesting videos you dig out of YouTube. But searching, downloading and then uploading files is a time consuming task. 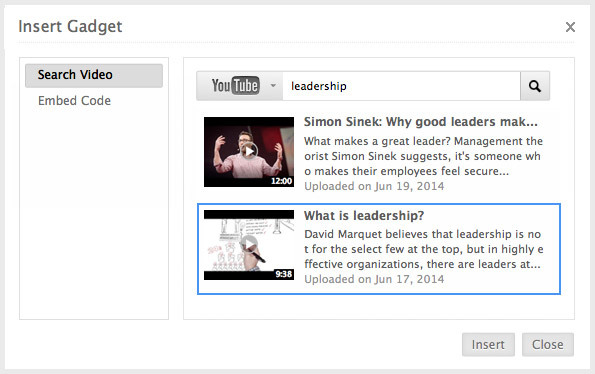 Zoho Show lets you search for images and videos on the internet without even leaving the presentation window. Additionally, you can also insert video files as URLs instead of spending time downloading them to your drive and then uploading them to your slides. Are you worried your colleague or collaborator might unknowingly rework or edit one of those slides with graphs and lots of numbers? 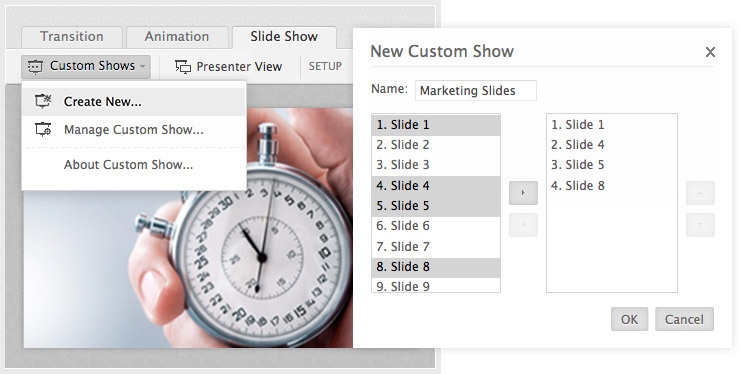 What if you could share a presentation, yet restrict co-users from accessing specific slides? With the Lock Slide feature, you can lock a shape or a complete slide, denying users the ability to make any further changes. The slide can only be unlocked by the person who locked the slide/shape. Your slides stay safe and secure! Reviews and edits can leave you with a completely different version of the presentation than what you had originally started with. But what if you want to go back to the older version of the same document? 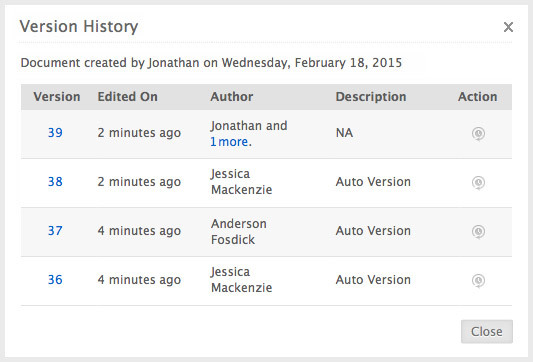 With Zoho Show it’s possible to keep track of all changes made in a document. It saves a copy of the file every time a change is made. This makes it easy for you to revert to any older version without any loss of content. Let’s say you wish to deliver the same presentation to different sets of audiences. It’s difficult and time consuming to create multiple copies of the presentation and customize each copy to suit your audience. Instead, use the Custom Slideshow function. It’s a quick way to pick and organize a set of slides from the original presentation to deliver a customized slideshow, whenever you wish to. Just choose the required set of slides that best suit your audience and avoid the rest. Quick and easy. Keeping the audience focused can be a major challenge to any presenter. This is one reason why only a handful of presentations create any desired impact. Try using twitter feeds in your slides. 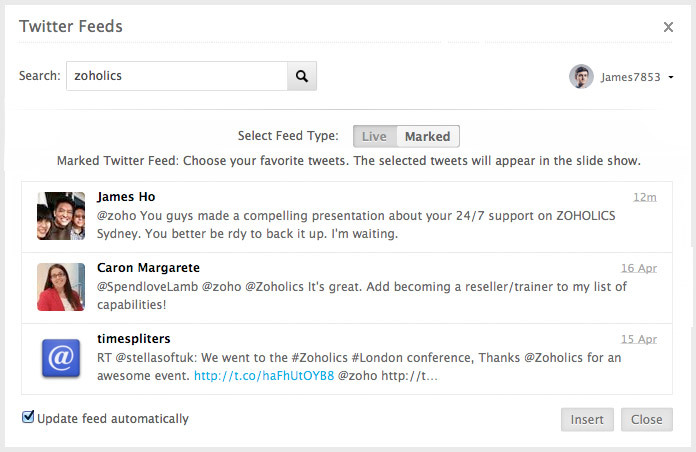 It’s an amazing tool that bridges the divide between a presenter and the audience.You can use twitter feeds to get your audience to interact with you in real-time as you present – be it polls to get a quick hand count or getting feedback on an idea being discussed! We all know sharing presentations can be annoying, especially if your slides are loaded with high resolution images, videos, charts, and tables. File size limitations don’t permit you to send large presentations over an email. The solution? Share the presentation online using just the URL. Your co-collaborators can view the presentation on their smartphones or laptops using just an internet browser. These are some simple tips that can help you create, edit, and deliver presentations quicker. 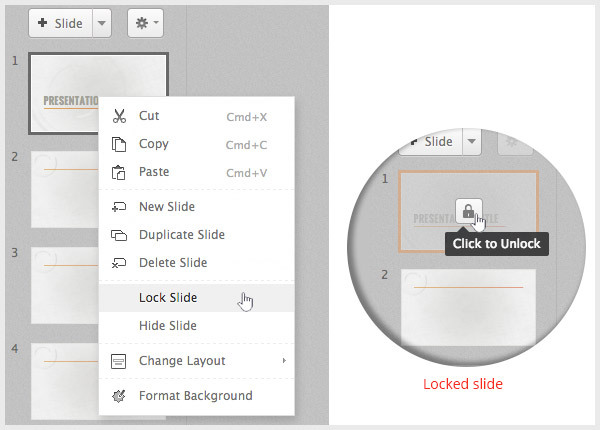 In case you are a PowerPoint user, we can help you migrate to Zoho Show without any formatting hassles. You can visit our website to learn more about this and the many other features we offer. If you have any questions, please leave them below or feel free to write to us at support@zohodocs.com. I don’t understand the point of this blog? These tips are all vague and don’t make a lot of sense. And they are not tips, you are just listing out features of the product. There are also a few grammatical errors in it. Sorry to be harsh, but I expect better from a company like Zoho. Thanks for your feedback. We acknowledge that the blog does have features presented as tips. We felt that a lot of users do not know about these features. The reason we make good software is because we constantly strive to improve. We are happy to learn from the shortcomings you have pointed out in this blog. We’ll definitely come up with a better blog next time 🙂 Thanks for taking time to read this post and sharing your thoughts.